Management of acute and chronic pain conditions can involve a complex array of treatment options. Handling your pain can be difficult, especially finding the right place that you can trust. Our dedicated pain team will work with you and your care givers to identify the best options for your condition. The wear and tear of life takes its toll on your spine. We provide complete pain care every step along the way. Whether it is in your neck, back or legs, our dedicated team of specialists will address your needs and provide effective relief. Our goal is complete satisfaction. A very painful and long-lasting condition characterized by severe burning pain, changes in bone and skin, excessive sweating, tissue swelling, and extreme sensitivity to touch. These injections are a common treatment option for many forms of low back pain and leg pain. Epidural injections (in all areas of the spine): the use of anesthetic and steroid medications injected into the epidural space with the guidance of xray to relieve pain or diagnose a specific condition. Common indications for CESI include neck pain, headaches, herniated discs, degenerate disc disease, radiculopathy or radiculitis, and spinal stenosis. Local anesthetic and steroid medications are injected into the epidural space with the guidance of xray to relieve pain or diagnose a specific condition. Injections done to determine if a specific spinal nerve root is the source of pain. This procedure is a diagnostic block in which local anesthetic is utilized with steroids. This block is often used to reduce inflammation and pain. An injection used to determine if the facet joints are the source of pain. These injections can also provide pain relief. Trigger points are painful areas of muscle that are tender and may feel like tight bands or knots when pressed. Trigger points are overactive muscle areas that can come from stress, using the muscle too much, or problems with the spine or with posture. The tender areas are marked and with a fine needle local anesthetic and steroid are used to help the muscle to relax. Pain sometimes persist even though your knee was taken care by the best Orthopedic surgeons. We have a solution; a very brief needle procedure may lower your knee pain for a very long time. Please indicate your joint problems to your doctor as well. An “inside” look into the discs to determine if they are the source of a patient’s pain. This procedure involves the use of a dye that is injected into a disc and then examined using x-ray or CT Scan. 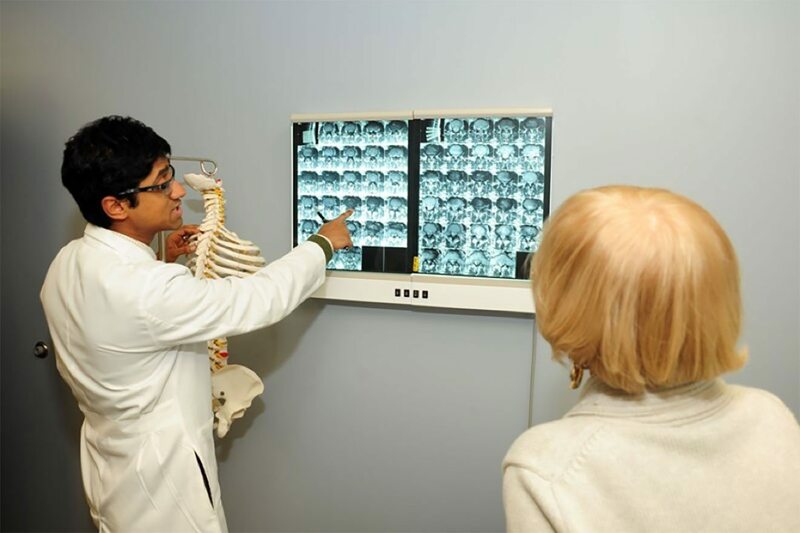 It is an important diagnostic tool for a patient that would require spine surgery. This is a treatment that uses radiofrequency energy to heat and destroy nerves to reduce pain. When a nerve is heated in this way, it can no longer send pain signals. RFN ablation is commonly used to treat pain arising from facet joints. Tiny nerves, called medial branch nerves, supply facet joints and transmit pain. RFN ablation destroys these nerves, and lessens pain: a minimally invasive procedure that disables spinal nerves and prevents them from transmitting pain signals to the brain. The use of electrical impulses and implanted generator that are used to block pain from being perceived in the brain. A surgically implanted pump that delivers pain medications to the precise location in the spine where the pain is located.